Mani Ratnam's Iruvar (1997) remains the only movie in Tamil Cinema that offers a panoramic glimpse into the glorious Dravidian Movement of Tamilnadu.The biopic presents a chronological view into the lives of two of the greatest personalities of Tamil cinema and Tamilnadu's politics, Mu.Karunanidhi and M.G.Ramachandran. There has been a general consideration that movies are the mirrors of the social, economical and political conditions of a country during a period, but this has never been true in India, I feel. Even during periods of political turmoil like wars, Emergency, Anti-Hindi agitations etc, Our cinema has never chose to speak about them. Hence, Iruvar being the only torch-bearer that tries to pass the history or legacy of this political and social churning to the next generation of young viewers, We (or rather, I) expect it to be factually exact. Iruvar is a cinematic wonder, no doubt .. The movie's period touch, excellent art direction, lyrical dialogues, brilliant acting, wonderful direction - No flaws, absolutely. It is one movie, I would always like to boast and discuss about when it comes to cinematic quality. But, Factual flaws - ?. There's a huge list of them ... The movie, of course takes care of tiny aspects like Veluthambi's Dhoti wearing style (Annadurai used to tie his dhoti improperly), Anandan's dance movements in songs (A very good replication of MGR's movements), Senthaamarai's bindi etc. But, there is a huge list of misrepresentation of political events and I chose to list only a few of them. I understand that this is a feature film and not a documentary and hence the director owns every right to manipulate around with the screenplay but still ... !!!. I wish he creates a documentary on this by making use of the already-done-extensive-research on the topic. Please click on the images for a magnified view. There were many instances in the movie where Veluthambi (Read C.N.Annadurai) is addressed as "Ayya" but E.V.Ramasamy (called Periyaar) has always been the "Ayya" and C.N.Annadurai was fondly called as "Anna" (meaning Elder brother) by his followers and the public. This way Mani Ratnam probably wants to convey that Veluthambi is both the "Ayya" and "Anna" and thus he creates some comfort for him, for the non-inclusion of Periyaar's character in the DMK's saga. Thus, the movie quite misleadingly refers to the birth of Dravida Munnetra Kazhagam (DMK) without any reference to Periyaar and the parent party - Dravidar Kazhagam (DK). 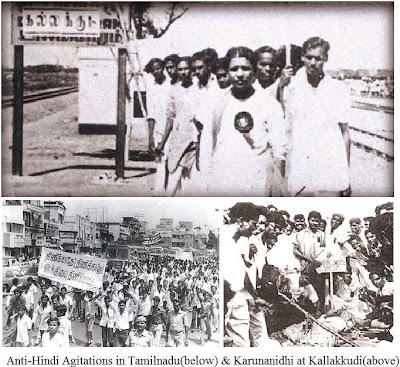 The most important political and social event in the post-independent Tamilnadu's history should be the Anti-Hindi Agitations of 1965. And, it was a grave injustice that there is absolutely no reference to this radical movement that shook the country during the 60s. The Secessionist politics of the DMK and the original demand for a separate "Draavida Naadu" were also carefully overlooked or ignored. The only related event that featured in the movie is Karunanidhi's "Kallakkudi Struggle" which in original was organised for the renaming of Dalmiyapuram Railway station as Kallakkudi. But, the movie presented a revolutionary Tamilselvam (Prakash Raj) conducting the demonstrations for the sake of Reservations. And, the punch of the protest was further mitigated by the romantic encounter between Tamilselvam and Senthaamarai (Tabu), in the midst of the turbulent agitations. 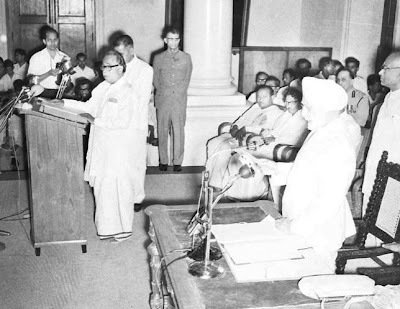 C.N.Annadurai taking Oath of office after DMK's stupendous success in the 1967 Assembly Elections. DMK rode the wave with an overwhelming electoral victory in the 1967 Assembly elections capitalising the Anti-Hindi agitations of 1965 and MGR's near-death encounter as he was shot in the throat by M.R.Radha. And, C.N.Annadurai - the then General secretary of the DMK became the first non-congress Chief Minister of Tamilnadu. In the movie, Veluthambi (Nasser) expresses disinterest on heading the state and Tamilselvam becomes the CM with Anandan's (Mohanlal) support. This way, the events that actually took place after Annadurai's death in 1969 - Mu.Karunanidhi becoming the CM with the support of MGR, were pushed ahead by approximately two years. The cinema entry of Mu.Ka.Muthu (Karunanidhi's son) as a competitor to an ageing MGR, created well-pronounced rifts in an already diminishing MGR-Karunanidhi relationship. Though the magnitude looks small, Mu.Ka.Muthu's "Pillayo Pillai" is still considered an immediate impetus that gave birth to the MGR's Anna-DMK. Thus, Maniammai (Periyaar's mistress) and Mu.Ka.Muthu hold a very important place in the state's political history - the former leading to the birth of DMK from DK and the latter leading to the birth of ADMK from DMK. Both find no mentions in Iruvar. The Dindigul by-election (1973) - MGR floated his political party ADMK in 1972 and was on a eager wait to prove his political mettle. The first oppurtunity came to him in the form of Dindigul by-election and ADMK's candidate Maayathevar defeated both the DMK and the Congress by a comfortable margin. 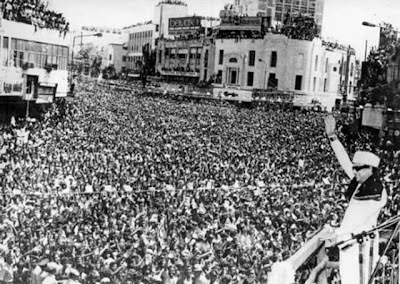 The victory marked a decisive shift in the politics of Tamilnadu and more importantly, heralded the arrival of MGR in the political scenario of the state. Interestingly, MGR's "Ulagam Sutrum Vaalibhan (USV)" faced a lot of troubles from the ruling DMK at the censors for its release and MGR emerged successful with both actually ... May 12,1973 - Release of USV and May 20, 1973 - Dindigul elections. 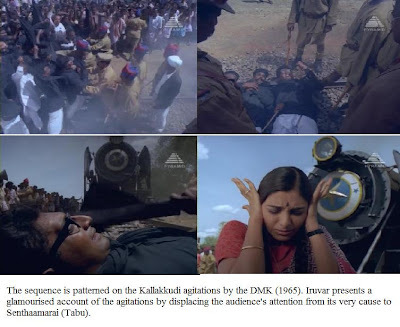 These events were absolutely absent in Iruvar, though there has been a small mention about this before "Kannai katti kolladhe" song but Tamilselvam lets the movie through with a criticism of his rule of the state. Operation Bluestar, Indira's Assasination, Anti-Sikh riots (Yeah, in that order), Bhopal gas tragedy - 1984 was arguably the worst year in India's history after independence. Dialysis, Apollo, Brooklyn - the most discussed words in Tamilnadu in 1984. The entire state was in a prayer mode conducting group-prayer sessions for the good health of their beloved Chief Minister, MGR. 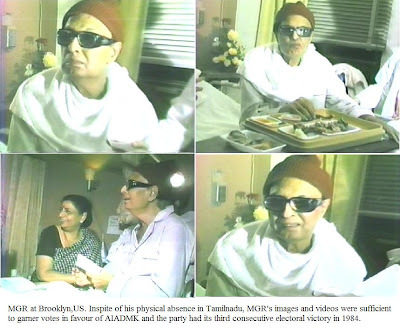 MGR was sick and was admitted in the Brooklyn hospital, United States and Jayalalitha Jayaram, R.M.Veerappan and Panruti Ramachandran were on the election campaigns. Apparently, people only required some proof that MGR was still alive and AIADMK used MGR's videos and photographs extensively during the campaign and the party comfortably packed another punch with a decisive third consecutive victory in the assembly elections. MGR came back in 1985 and was sworn in as the Chief Minister of the state, the third time. There was a lot of drama in the AIADMK after the death of MGR in 1987, regarding the party premiership - MGR's widow Janaki Ramachandran on one side and his favourite lead lady in the cinemas, Jayalalitha on the other side. But Jayalalitha, with her charismatic personality and iron will was able to win the support of the party and has held the party intact since then. Jayalalitha is by far the most controversial political figure of the state and Iruvar chooses to erase this off the history books - Aarghh !! Hope you enjoyed the history ride !!! This is an excellent analysis on an awesome movie. I suggest you do post some of the facts at wikipedia. It took a few creative liberties which it could have done without. I wish Maniratnam released the movie as a Director's cut without the music censoring important dialogue. It would be interesting to see the same. மிக சிறந்த பதிவு.... தங்கள் பணி சிறக்க வாழ்த்துக்கள். Very true! But the movie had enough opposition as it is, if some of these were included(like MK Muthu issues) the movie would have faced even more problems and they would have asked for these scenes to be removed! One must understand Mr. Ratnam's reasons were more than mere artistic / creative liberties. As it is the movie faced severe opposition to it being released. A more accurate depiction of contempary politics would have got the movie banned. And he probably chose to avoid anti-hindi protests and the core of dravidian movement ( anti-brahminism ) owing to not incite any racism / protests etc. ( any slim chance of that happening again ). I would like to thank Gokul for this blog. I was not interested in politics but when I watched Iruvar, it kindled me to explore more about it. Especially the censored dialogues. I have been reading a lot of articles and listening to audios related to the events in this movie and stumbled upon this article. It is really interesting to know about our history from different perspectives. This movie cannot be expected to completely capture the entire chronological events that happened in Tamil Nadu in reality. This movie was inspired by the real world friendship, relationship and ego altercation between MGR and Karunanidhi from the context of Tamil cinema and Dravidian politics, but it was a fiction. This means the director has liberties to carve out his own story at the backdrop of MGR-Karunanidhi relationship and Dravidian politics. In fact, he has not used any real world names for any characters. It is up to the discretion of the viewer to identify the characters and relate them with real-world characters and events. This is not a documentary or biopic. I do not agree to your point that this movie has factual flaws since it was never made with an intention to portray a factually-correct chronological real world biopic, as detailed above. Antichrist (2009) - Incomprehensible !! !